The state’s development chief called $1.2 million in infrastructure improvements planned for a Lynnway residential development the latest example of how a local, state and federal partnership are spurring the city’s economic revitalization. Housing and Economic Development Secretary Jay Ash told the nearly 60 attendees at the Lynn Business Partnership’s meeting Monday that the MassWorks grant will pay for water and sewer pipe work to support the 348-apartment project. It will also pay to upgrade a traffic signal at Market Street and the Lynnway next to the development site to improve traffic flow and provide safe entrances and exits from the site. Ash said the Lynnway development site improvement was one of “the most promising projects” among 114 MassWorks funding applications. Lynn City Council President Daniel Cahill addresses members of the Lynn Business Partnership at Eastern Bank headquarters on Monday. 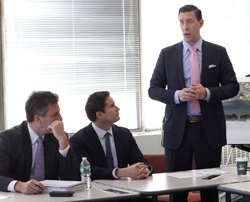 Jay Ash, state Housing and Economic Development secretary, left, and U.S. Rep. Seth Moulton listen in. A North Andover developer plans to start construction on the former car dealership site next summer with the infrastructure work done in the spring. Ash and other speakers Monday pointed to the Lynnway development, the Market Basket store construction on Federal Street and downtown development as achievements credited to the Lynn Economic Advancement and Development (LEAD) team formed in late November 2015. “As a result of the work the LEAD team has done, the renaissance of Lynn has not only begun; it is really healthy,” Ash said. A $2.5 million MassWorks grant is paying for street and sidewalk work and other improvements around the Market Basket site. The store is scheduled to open in late summer 2017. LEAD formed to ignite Lynn’s economic revitalization by making sure local, state and federal initiatives are focused in the same direction. The team’s work and a Sept. 20 city tour for prospective developers has gone a long way to spur interest in the city, said Joseph Mulligan, a MassDevelopment transformative development initiative fellow working in Lynn. “Lynn is now positioned on their radar screen as a place of opportunity,” Mulligan said. Economic Development & Industrial Corporation (Lynn/EDIC) Executive Director James Cowdell said the transformation of the former 23 Central Ave. bank and office building into 48 market-rate apartment demonstrates the progress LEAD has made. “We can reflect on the last year’s worth of accomplishments and look into a very bright future,” he said. City zoning changes implemented in 2003 created a streamlined “by right” provision to spur the development of downtown building. The Central Avenue project is slated to be completed by next May. Mayor Judith Flanagan Kennedy said development on another downtown site — the former Anthony’s Hawthorne restaurant on Oxford Street — won’t start until contaminants underneath the former Whyte’s Laundry site a block away on Willow Street are cleaned up. “First things first,” Kennedy said Monday. City Council President Dan Cahill said increased development must be coupled with efforts to monitor the implications of rising rents locally. State Sen. Thomas M. McGee said improving economic fortunes shines a spotlight on city and regional transportation shortcomings. An advocate for extending Blue Line mass transit service to Lynn, McGee on Monday said he is frustrated the extension is not a key element in state regional transportation planning. “We’re not going to accept a lack of transportation in our region anymore,” McGee said. “Businesses are starting to look at gridlock and say, ‘What can be done?’ I disagree with the administration’s lack of vision on this,” he said. Thor Jourgensen can be reached at tjourgensen@itemlive.com.